These two top rated coolers are like Burger King vs McDonalds or Coke vs Pepsi. If you’re on the market for an ultra-durable roto molded cooler, Orcas and Tundras are both great choices. 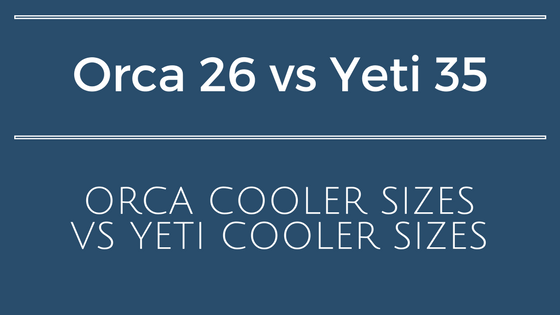 In the second part of our “Orca Cooler Sizes vs Yeti Cooler Sizes Series,” we’ll tackle the 26 Quart Orca vs Yeti Tundra 35 Cooler Comparison. 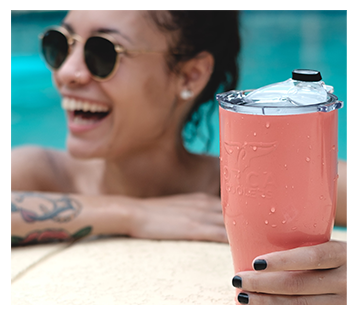 This colorful top rated cooler gives Yeti a run for it’s money, that’s for sure. 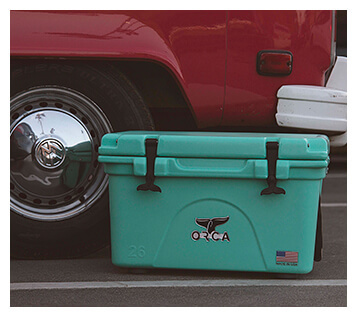 Since the Orca 26 Quart Cooler and the Yeti Tundra 35 are closest in capacity, they’re a good fit for a side-by-side cooler comparison. Both of these best rated rotomolded coolers have fantastic construction. 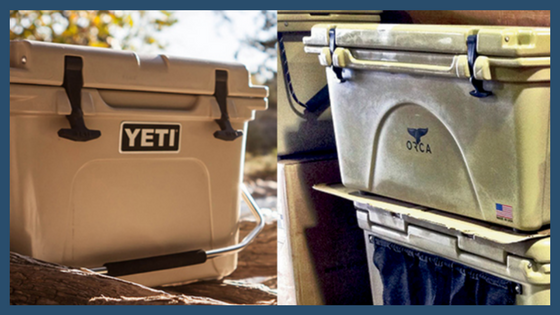 But in the 26 Quart Orca Cooler vs Yeti Tundra 35 standoff, how do they compare? First, we’ll look at Yeti’s construction. Remember to add a dry goods basket to your shopping cart, if you buy an Orca! As you can see, both of these mighty beasts are constructed in similar ways, with just a few differences. Orca Ice Chests have thicker insulation. In fact, their foam insulation is 30% thicker than the Yeti Roadie’s! Also, Orca Coolers have an outer mesh pocket for storage. The Yeti Tundra 35 is UNBREAKABLE! First, their handles are made from slightly different materials. Finally, rotomolded pieces of equipment are among the strongest in the world. Not to mention the two more videos like this one! 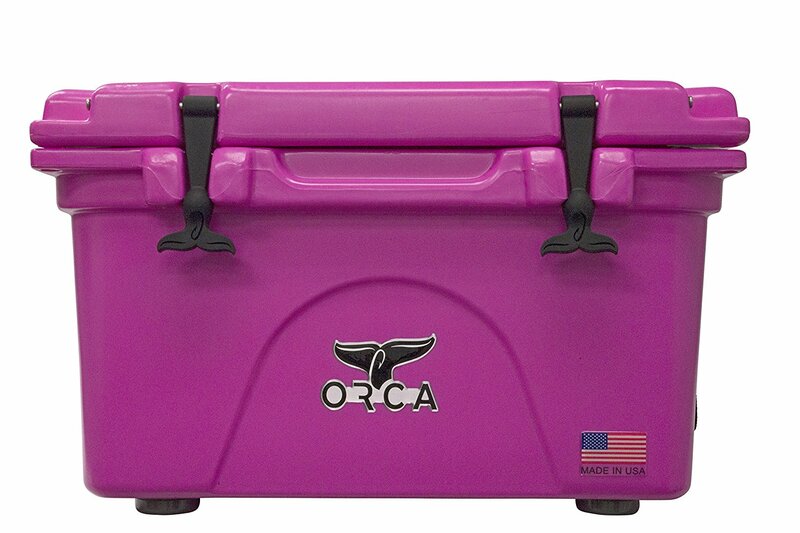 Click to see more pictures of this unbreakable Orca 26 Quart Cooler. Their lids *may* snap shut unexpectedly. Another shared feature is their long handles; these make two-person carrying easier. Another similarity is that they’re both heavy compared to other high end ice coolers on the market. 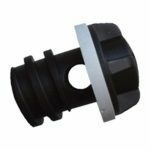 Second, Yeti drain plug has a hole on the screw-on part, so you can partially unscrew it to slow down the water flow. Thirdly, it’s easier to store small items you want to keep dry in the Orca, since it has a side mesh pocket. Overall, the pros and cons of each brand of ice chest weigh each other out. So we’re calling a tie in the 26 Quart Orca vs Yeti Tundra 35 “usability” section. Using dry ice will keep your contents frozen, which is great for fishing and hunting weekends. 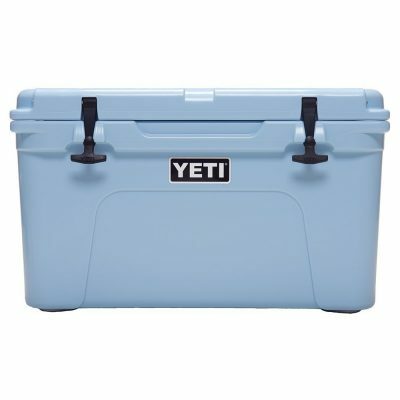 Where Are Yeti and Orca Cooler Made? It’s a myth that Yeti Coolers are 100% American-made. Sure, their head quarters are in Texas. And Yeti manufactures some of their coolers in Wisconsin and Iowa. But they also have large factories in the Philippines where most of the manufacturing occurs. Both of these top rated coolers cost about the same. Usually, you can find an Orca 26 Quart Cooler for a little less than a Yeti Tundra 35 Cooler. However, the differences in price are small. So, in the “26 Quart Orca vs Yeti Tundra 35 Cooler Sizes Review,” this is a tie. In short, these are two of the best high end rotomolded coolers. They’re both worth an investment of a lifetime. Now the Yeti Tundra 35 comes in 3 classic colors: Desert Tan, White, and Ice Blue. In contrast, the Orca 26 Quart has 8 colors to choose from: Pink, Green, Navy, Black, Pink, Light Blue, Seafoam, and White. In Orca’s collection of high end rotomolded coolers, there are 17 Collegiate Coolers. If you visit Orca’s website, you’ll find the entire collection! 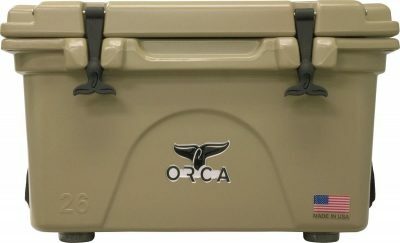 So, who wins the 26 Quart Orca vs Yeti Tundra 35 Cooler Standoff? 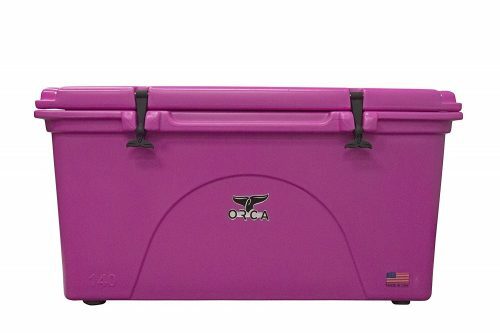 If you’re willing to make an investment, we believe the 26 qt Orca Cooler is the best cooler for the money. If you know your new discount Yeti cooler will take lots of beatings over the years. 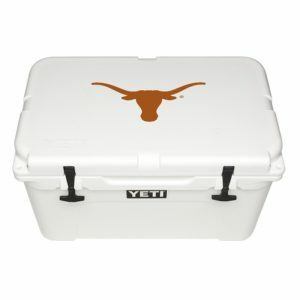 Or, you really want one of the collegiate coolers offered by Yeti. These two coolers are neck in neck. But why is it such a serious standoff? The following is an easy-to-read comparison that leaves no stone uncovered. You’re going to find it all here, with none of the good stuff left off. After all, you don’t have all day to waste time reading a cooler comparison that only answers some of your questions. 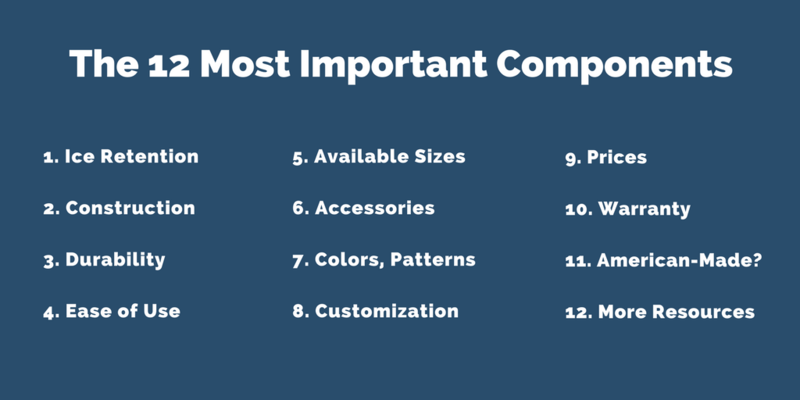 You’ll find detailed info about the 12 most most important things to know before spending your hard earned cash. 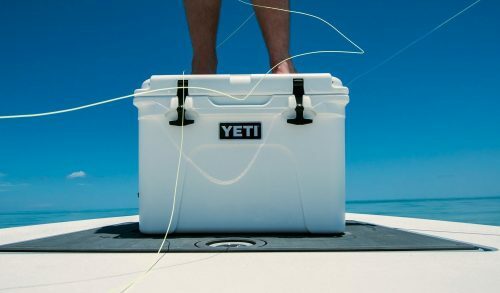 Yeti Coolers come out on top in this category of the Orca Coolers vs Yeti Coolers rivalry. 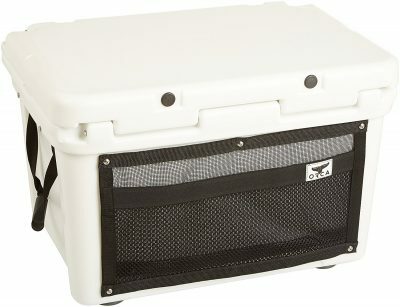 Yeti coolers range from the Yeti Roadie to the Yeti Tundra 350. In contrast, Orca Coolers range from the Orca 20 quart to the Orca 140 quart. As you can see, Yeti offers a much wider range of capacities. Notably, Yeti Coolers’ numbers don’t represent capacity. 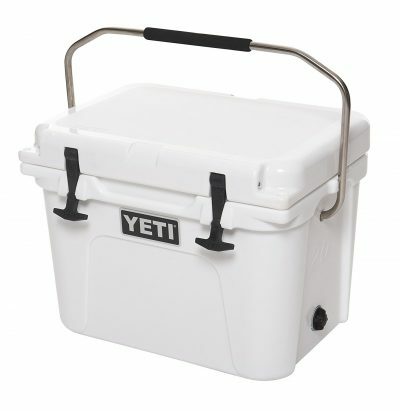 For example, a Yeti Tundra 105 is only capable of holding about 87.2 quarts. 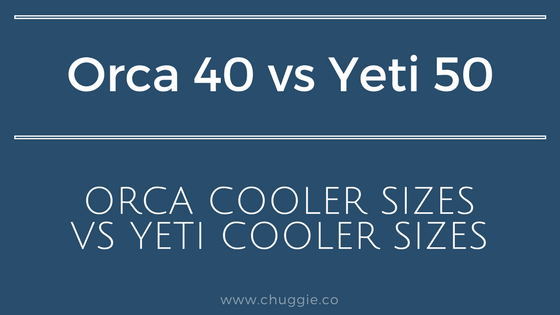 If you have a specific size you want to compare, each of these offers customized Orca vs Yeti Cooler Size Comparisons for a more specific comparison. Ice retention is the name of the game. After all, you aren’t shelling out your hard-earned money to tote around boxes of miscellaneous objects. This is your sustenance we’re talking about. These are your weekends we’re talking about. Click for more pictures of this Orca beauty. Yeti coolers almost always have worse ice retention than other top tier ice chests. 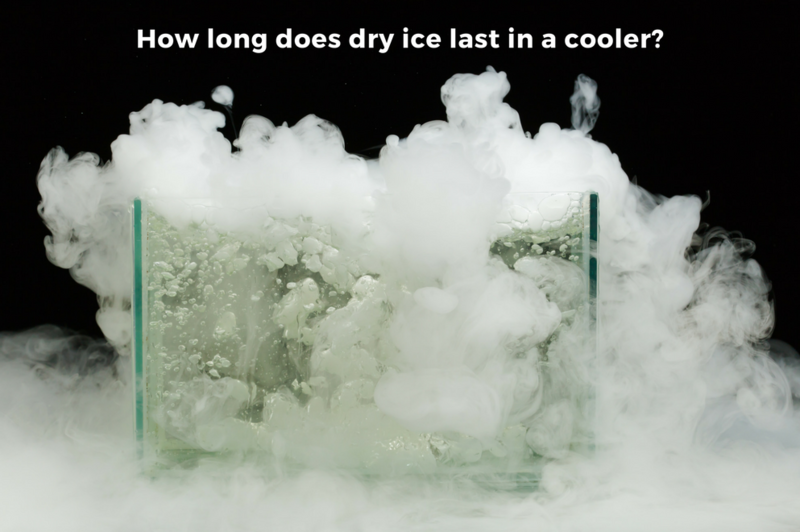 Sure enough, Orca Coolers retain ice for an average of two days longer than Yeti Coolers – or more. This may be due to Orca Coolers’ extra inch of insulation in their lid. 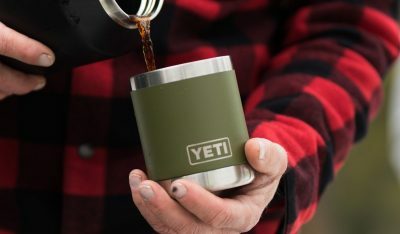 Yeti offers a two-inch lid, while Orca is constructed with a three-inch lid. According to many, Orca’s last an average of 3-5 days longer. Both of these rugged molded coolers have fantastic construction. But how do they compare? First, we’ll look at Yeti’s construction. 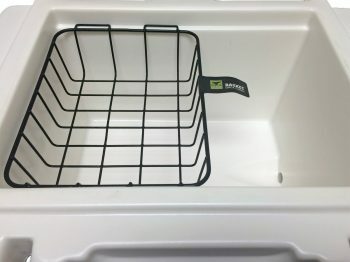 Don’t forget to add an Orca dry goods basket to your cart. You’ll be glad you did! Orca Ice Chests have thicker insulation, which may lead to better ice retention. Yeti’s drain plugs have a hole in them. Lastly, their handles are made from different materials. However, they’re both tough cords with rubber grips. Orca Coolers vs Yeti Coolers: Is One More Durable than the Other? Unsurprisingly, both of these beastly ice chests are durable and able to take a beating or ten. The plastic that makes up their body and lid is the strongest kind. In fact, it’s so strong kayaks are crafted from the same material. The riveted pin system keeps their hinges right where they belong. They’re both Certified Grizzly Bear proof. Just take a look at the video of a Grizzly Bear attempting to open an Orca 140 quart. Yeti Coolers hold up just as well under Grizzly Bear attempts. 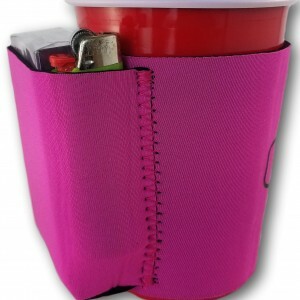 The mesh pocket on the Orca Coolers is ultra convenient! Both coolers’ lids *may* snap shut unexpectedly, according to some reviews. Yeti’s accessory collection is as wide and varied as Orca Cooler accessories. 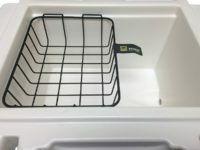 Handy cutting-board dividers, fishing rod holders, and beverage holders come with many of their coolers. And that’s just mentioning a few of the basics. 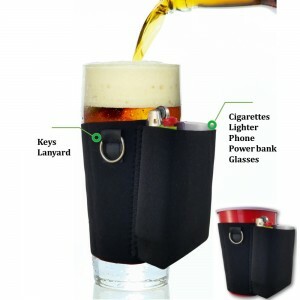 There are plenty of others – just a couple of examples are the wall mounted bottle opener and drain plug hose connection. 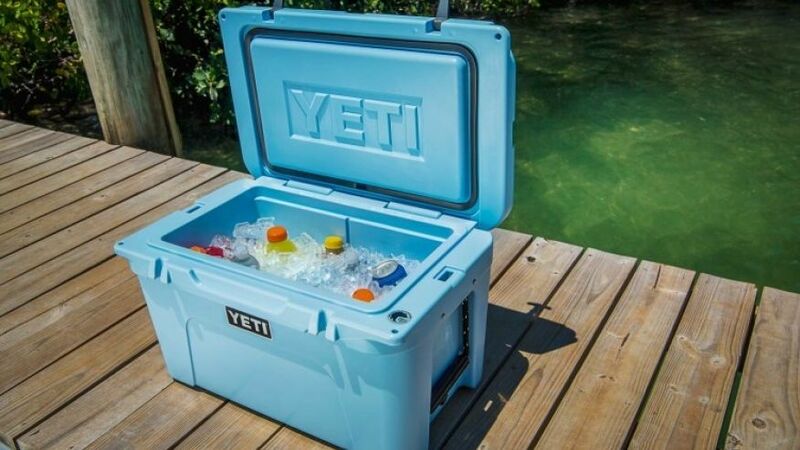 It was the talk of the town in 2013 when Yeti came out with their Ice Blue Coolers. Take a look at more beautiful photos! If you like basic, you’ll likely be pleased with Yeti’s 3 main colors for their roto molded ice chests. When Yeti first came onto the market, White and Desert Tan were the only options. 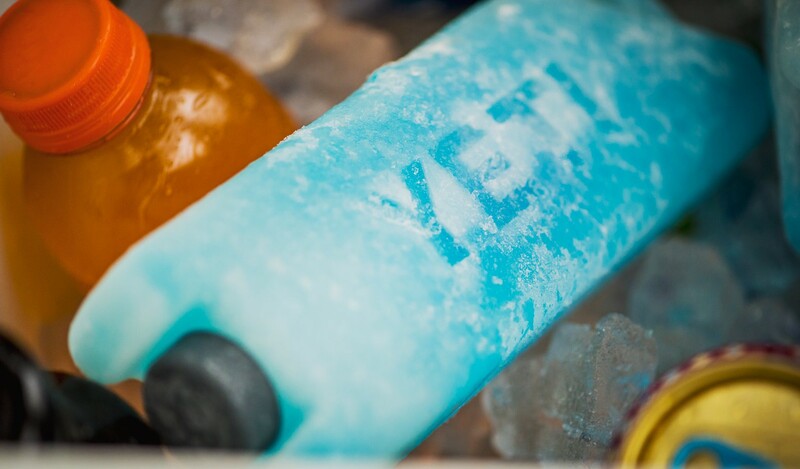 In 2013, Yeti introduced their color called ‘Ice Blue,’ adding at least a little color to their drab selection. Similarly, Orca offers standard basics like White and Tan. However, these roto molded masterpieces also offer brighter colors like solid Pink and Green. If you want to branch out from the norm, you can find colors like Orange, and Pink right here. In addition to all of the fabulous colors available, Orca makes camouflage ice chests. Yeti’s Collegiate Series gives so many people the opportunity to represent their alma mater in style. Check to see if your university’s logo is available; there are 38 college logos to choose from. Of course many of the logos are colorful, sprucing up otherwise boring (in our opinion) colors. 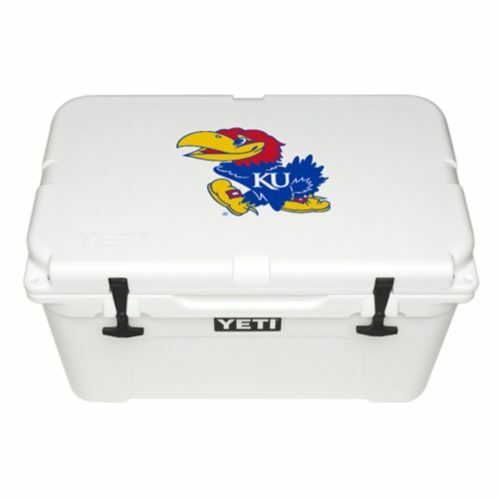 Click the Kansas University cooler to find many more schools available! Visit Yeti’s Custom Cooler Shop to have your logo added to your Yeti Rambler. Show off your business’ logo or any type of sweet design you came up with. Yeti also offers a giant selection of pre-made logos. For example, in one subcategory alone, fishing, there are 17 logos available. Orca also has a collegiate series of coolers and drinkware. Although it isn’t quite as big as Yeti’s collection, their colorful coolers and tumblers are the most cheerful accessories one could ask for. 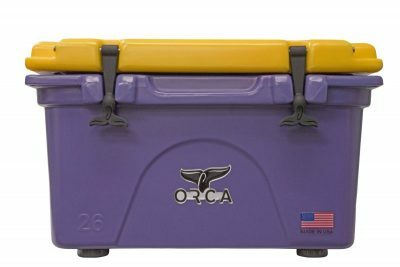 Orca Coolers vs Yeti Coolers: Are Orca Coolers as Expensive as Yeti Coolers? 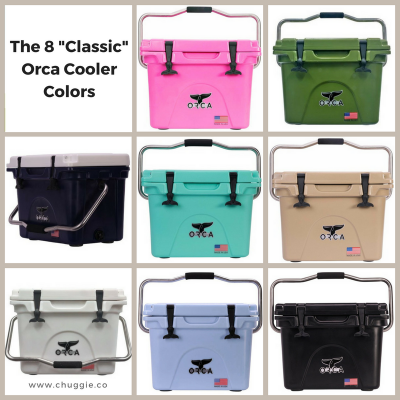 Prices are also quite similar between the two brands, with Orca Coolers being an average of about ten to twenty bucks cheaper than Yeti Ice Chests. In our books, that isn’t enough to say Orca has any sort of advantage over the Yeti. The warranties couldn’t be more different than the sizes and prices are similar. The Yeti Coolers’ five-year warranty gives us some degree of confidence in the Yeti brand’s workmanship. But five years seem pretty measly next to Orca Coolers’ lifetime warranty. Additionally, their Yeti Hoppers and Ramblers are manufactured in China. Yeti doesn’t say how much they manufacture in the US, but we’re willing to place a huge bet that it isn’t here in America. 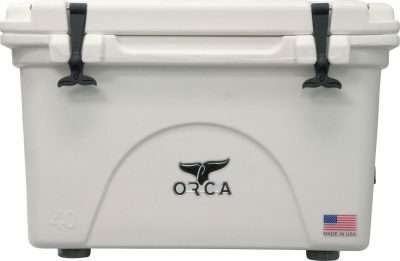 Are Orca Coolers really 100% American Made? Another question we often hear is asking which ice chests are American-made. 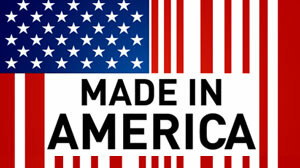 Unfortunately, there aren’t many coolers that are both manufactured and assembled in the US. *But* Orca brand ice chests are one of the few verified American ice chests. Orca Coolers have much better ice retention. Plus they come with a lifetime warranty. The Orca Gear Molle Wrap…need we say more? Orcas have a bigger variety of colors and patterns. 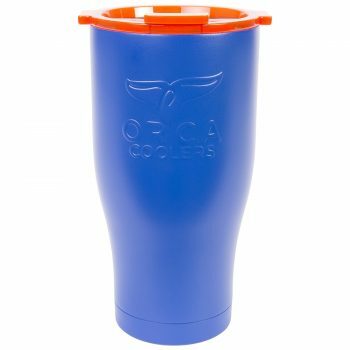 All this being said, Orca Coolers are only available in sizes up to 140 quarts. Yeti extends all the way to 350. In that area, Yeti Coolers are winning by a landslide. Both ice chests are pretty damn dependable. They’re built well, are similar in most categories, and even look alike. Of course, different people will be happier with different brands. It all depends on your preferences for factors like ice retention, customization, etc. 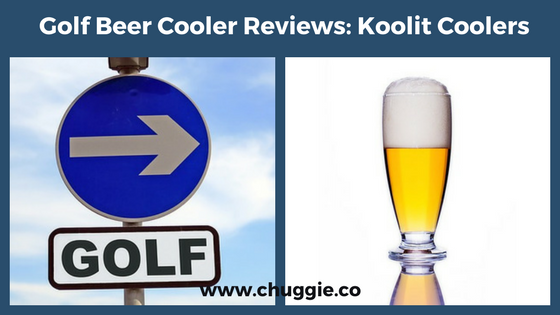 This review is a profile of just Orca Coolers, rather than a comparison. 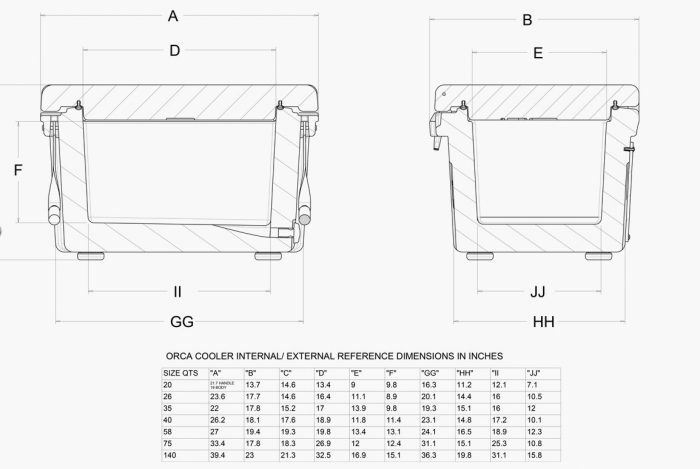 Here you’ll find more information about Orca Coolers, including Orca dealer information. 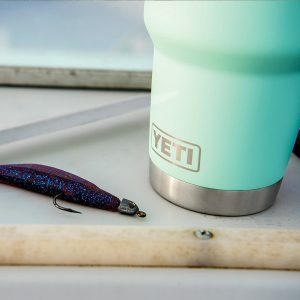 Charts of the various Yeti Tundra models, videos, and reviews of each Yeti Tundra size, you’ll find the nitty gritty specifics on the Tundras from the small Yeti Roadie all the way up to the Yeti Tundra 350. 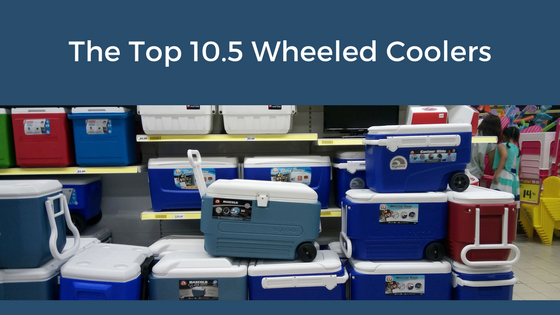 If you’re on a market for a new wheeled cooler, “The 10.5 Best Wheeled Cooler Reviews + Guidebook” is for you. So, let’s jump right into it! Add wheels to just about anything and it becomes that much more awesome. Note: Our Price-O-Meter is based on a scale of 1-5. Follow the link for more pictures of this beautiful invention! 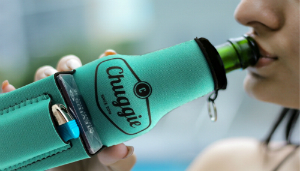 Durability: The Igloo Party Bar Thermoelectric Cooler withstands wild parties time after time, and most reviewers don’t experience problems. However, the plastic lid is reportedly weak and prone to bending or warping. This certainly isn’t a tough roto-molded cooler like a Pelican or Engel. Durability: It’s no wonder that the KOOLMAX 40 Quart Wheeled cooler is on the lower end of the durability spectrum. Understandably, there’s a tradeoff for all the kickass features. 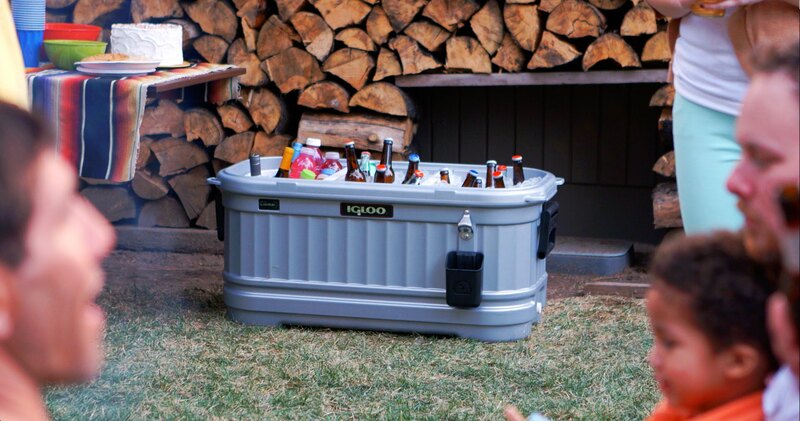 It’s a superb cooler for low-impact hobbies like patio parties. Durability: This is an Igloo cooler, which is neither good nor bad. Igloos are fabulous for picnics or a day-long yoga session at the park. However, they’re no match for high-end coolers like a Bison or Engel. If you don’t plan on participating in any high-impact activities, you will be just fine. Impression: The fact that these wheels can trek through sand is a lifesaver for beach-goers. The countless special features and good ice retention combined with over-sized wheels are enough to persuade any outdoor party person. Durability: There are mixed reports. Our assessment is a mid-level durability score. Impression: The Cruzin Cooler 50 Series 500-Watt Electric Cooler is, in a word, dope. Scooters are timeless and will forever be a hipster’s mode of transportation. Just imagine how many craft beers will be in transit every day! Durability: The rotomolded polypropylene plastic makes the Pelican ProGear 80 stronger than most. Stainless steel hardware also contributes to its durability. 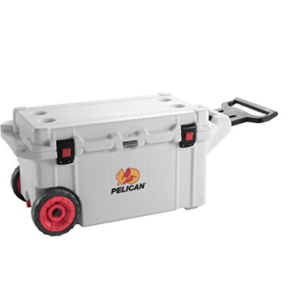 Impression: Pelican Coolers have always been one of the best high-end coolers. 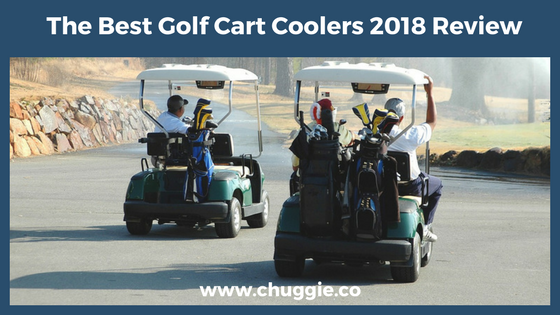 It’s no surprise that the wheeled cooler is just as robust. This is for you if you want a top-tier cooler to last a lifetime. Bears can wave hello all they want, but they don’t stand a chance against Pelican Coolers. 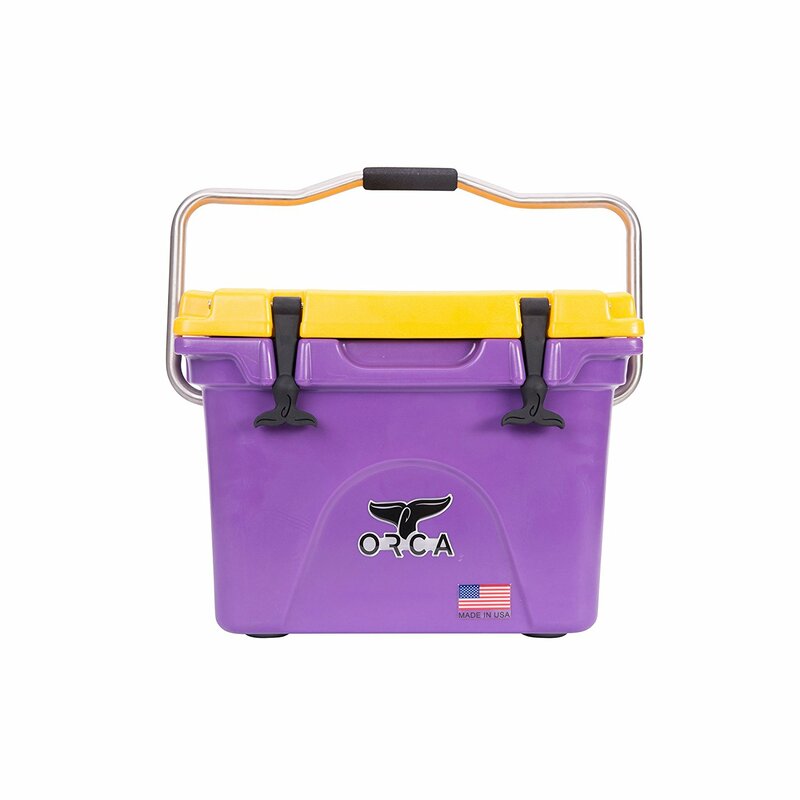 Durability: The rugged, roto-molded design presents an exceptionally tough ice chest. Impression: Dometic lives up to their reputation once again with this sturdy wheeled cooler. The ice retention is nearly unbeatable, making this the ideal cooler for longer ventures. It depends on individual tastes, but some people are turned off by the lack of extra gadgets and unique features. 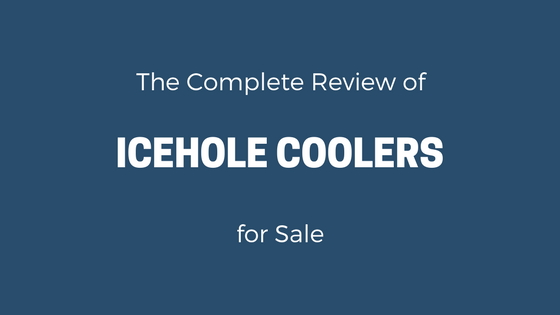 The Dometic Avalanche is ideal for those of you who just want a straightforward cooler. Durability: The cooler itself is tough. Although some reviewers report problems with the cart. It can be tricky to connect securely to the cooler, until you get the hang of it. It isn’t quite as resilient as a Pelican Wheeled Cooler, but that’s to be expected from a less expensive product. Impression: Despite a small portion of disappointed reviewers, the overall rating tells the true story. Features like multiple compartments and long ice retention play a huge role in assessing a cooler. Plus, you’re essentially getting a free cart because you can use it to carry virtually anything else. On a budget? 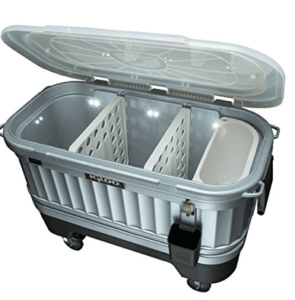 The Coleman or the Arctic Zone are the Wheeled Coolers for you. Capacity: 62 quarts, or 83 beverage cans with plenty of ice. Durability: Manufacturers roto-mold strong polypropylene to form the body and lid. While polypropylene is strong, this type of plastic just can’t compete with high-end cooler brands, like Grizzly or Yeti. For most of you, that won’t be a problem. 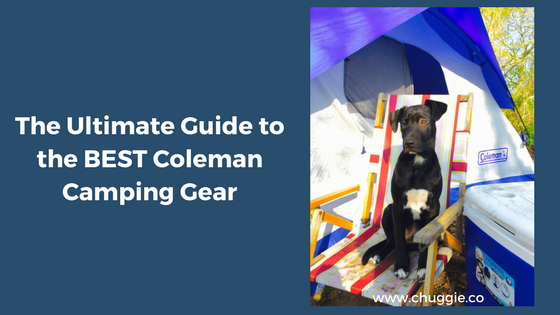 One mother of six kids showed us that her Coleman works just as well as it had twenty years ago, when she bought it. It’s strong enough to weather two decades of frequent use, and those hooligans were wild back then. The durability factor isn’t a problem in many circumstances. Impression: The Coleman 62 Quart Xtreme Cooler with Wheels is functional and easy to use. That’s the balance every cooler specialist dreams of. The all-terrain wheels will come in handy for trips to the beach, picnics in the park, or tailgating. Durability: The steel and brass composition of the Steel Bar Bistro offer strong protection from years of heavy use. The finish is fade, crack, and chip resistant. Impression: This “Rolling Party Steel Bar Bistro” improve the feng shui of your patio. Get the red one; it’s the most playful and fun for entertaining guests. It does a great job of filling this patio cooler niche. 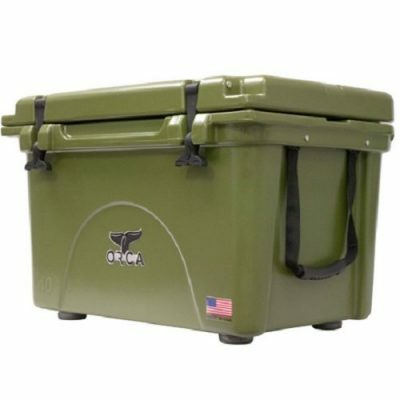 Bison Coolers are 100% American made. 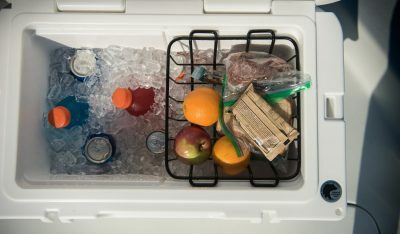 Impression: Bison Coolers are roto-molded from the toughest materials possible to produce one impenetrable ice chsest. This is one of the best high-end coolers for sale today. 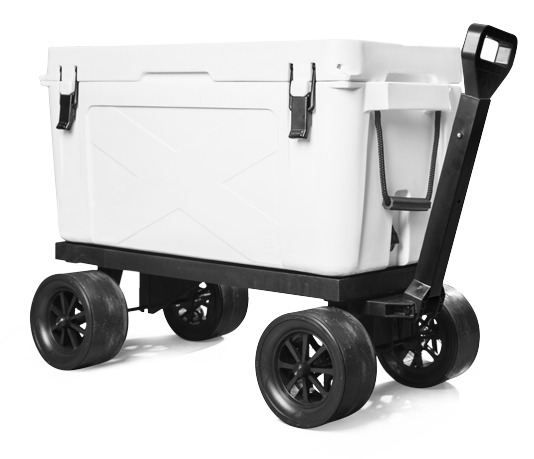 Bison’s new cooler dolly works with most cooler brands, and adjusts for different sizes. Bison Coolers have been easy-to-use and functional for years. Thankfully, Bison very recently introduced a new accessory: The Bison Hauler. This strong, polymer wheeled cart extends or retracts to fit each different size. The extended handle is sturdy and comfortable. This strong cart is hard to pass up, especially with the $130 price tag. Just imagine the beautiful spots outside which will now be your favorite reading nooks. Bonus Points: You can use the Bison Hauler for transporting any other type of material, as long as it isn’t above 600 pounds. Wondering About Yeti Coolers With Wheels? Yeti Cooler Wheels: DIY, Rambler, Badger, and More! is here to help. Unfortunately, Yeti doesn’t sell coolers with wheels yet. However, there are plenty of options to have your Yeti rolling along in no time! But it’s tricky to look at a list like this and know which portable cooler to invest in. 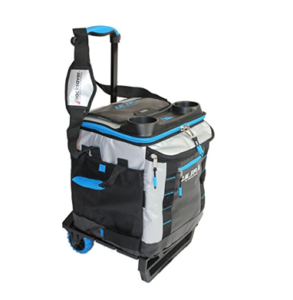 The Arctic Zone Ultra Collapsible Rolling Wheel Cooler is the cheapest of all. It has some one-of-a-kind features plus good ice retention. 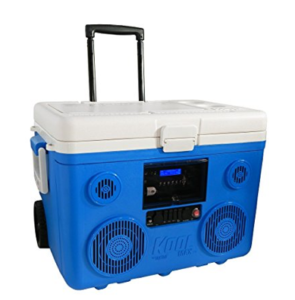 The Igloo Party Bar Cooler usually lands in the less-than-two-hundred category. What’s not to love about a portable bar with 16 LED lights? 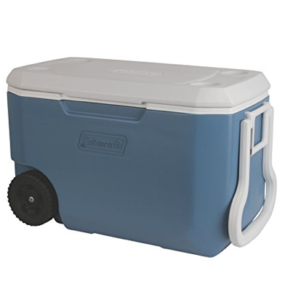 The low price tag of the Wheeled Coleman Xtreme 62 Quart Cooler is awesome.This sturdy, popular ice chest is not only easy to use; it’s an all-around good investment. What’s not to love about a nature-friendly party bar? Follow the link for more pictures. Take the Pelican ProGear 80 Quart Wheeled Cooler on all your wild rendezvous. The roto-molded polypropylene and pressure-injected foam is unbeatable. The Dometic Avalanche Heavy Insulated Ultimate 65L Wheeled Cooler (talk about a mouthful) will impress you with its resilience and long ice retention time. Dometic uses part of their earnings to promote sustainability. 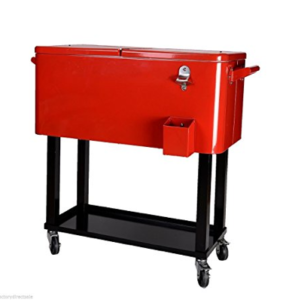 The Bison 50 quart and cart are tougher than tough, so you can count on them to work well for a long, long time. The KoolMAX 40 qt. 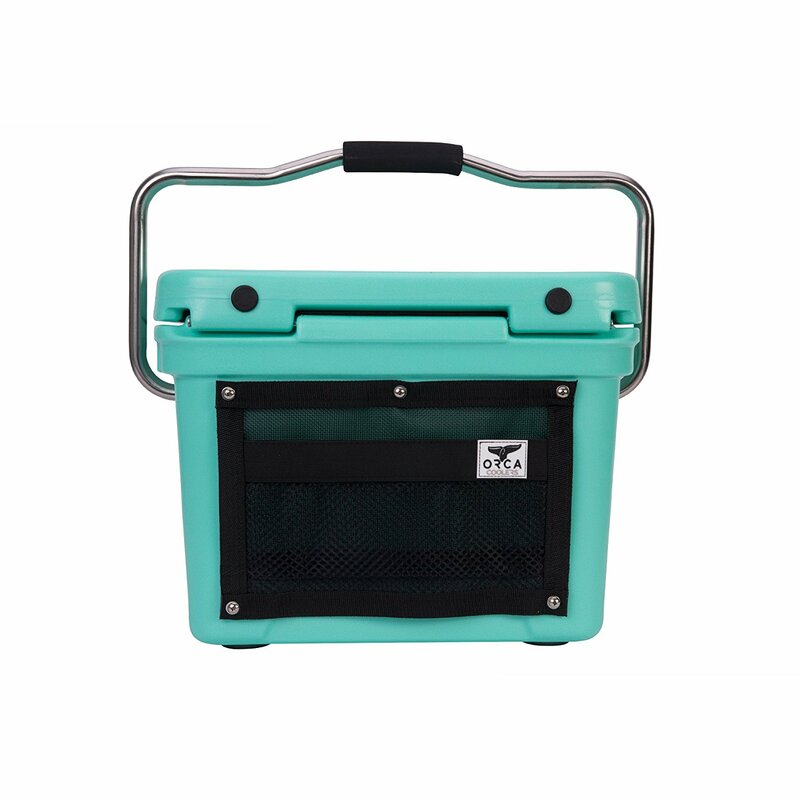 Wheeled Cooler is perfect for jamming out. The best place to do this? At the lake, on the deck. Or, find a hidden spot in the woods and play some Bob Marley. 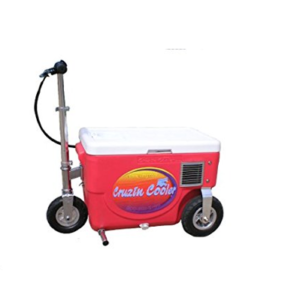 The Cruzin Cooler 50 Series 500-watt Electric Cooler is a scooter/cooler hybrid. 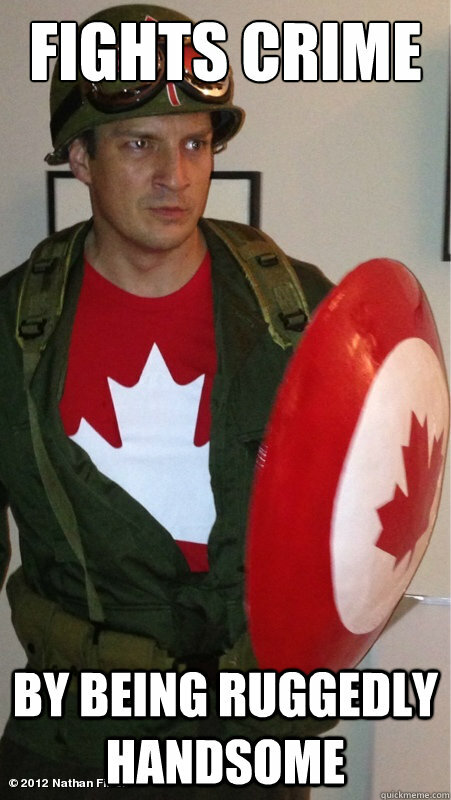 Words cannot express how awesome this is. 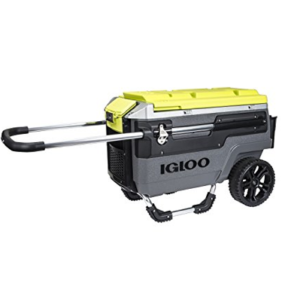 For a less expensive option, consider the Igloo Trailmate Journey Wheeled Cooler. 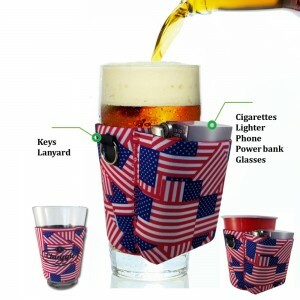 The cup holders, butler tray, and two bottle openers practically scream “take me somewhere wild and day drink to your hearts content. The Cooler Beer Cart Outdoor Rolling Party Steel Bar Bistro is a must for those of you who love parties in the backyard or patio. It’s stylish and will impress your guests. There’s a little bit of everything in the listed coolers. You have plenty of options, no matter what category(ies) you identify with. Here are a couple pro-tips before you click the “buy” button. #1. 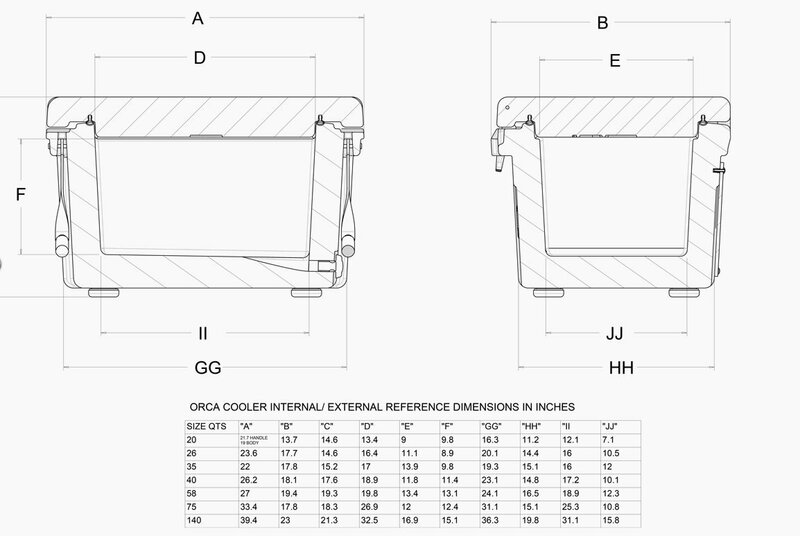 Since wheeled coolers are new to many of you, we urge you to really look at each component’s dimensions. It’s important to make sure the length of the handle is appropriate for you. #2. Additionally, the wheels are a biggie. For example, the Cooler Beer Cart Outdoor Rolling Party Steel Bar Bistro doesn’t stand a chance of rolling smoothly over rough terrain.